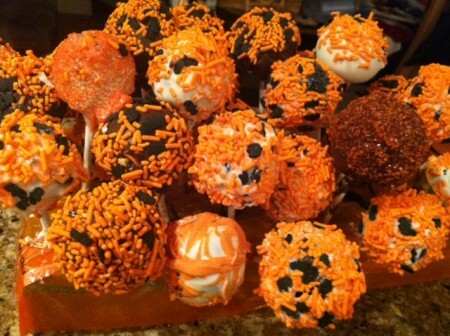 As soon as I saw this Cake Pops recipe I wanted to make cake pops and Halloween seemed like the perfect occasion. 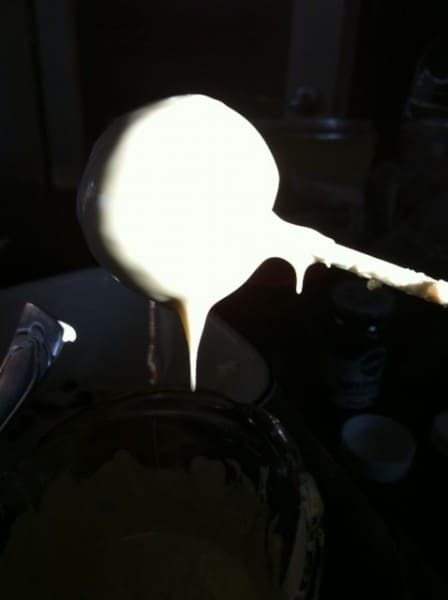 As it turns out cake pops are very time consuming and a lot harder to make than I thought they would be. 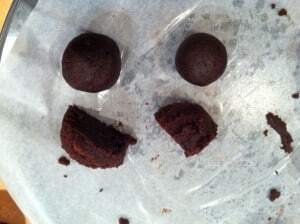 You can read all about my first failed attempts in my previous post “How NOT to Make Cake Pops”. 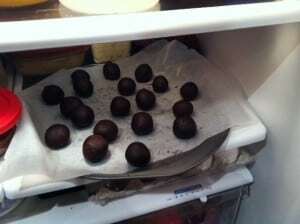 I’m happy to say that I finally figured out the trick to cake pop success and I will share my tips with you below. 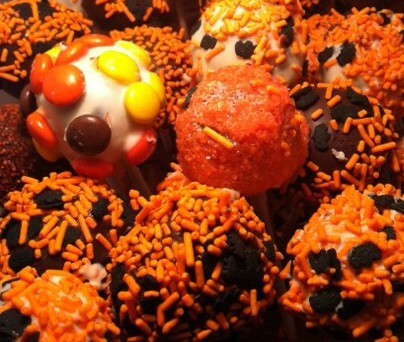 To see how I prepared the cake balls themselves, pop over to “Halloween Cake Pops Part 1” which has baking photos and tips. First, place your chilled cake balls in the freezer for approximately 20 minutes, just enough so that they will hold their shape when you insert the lollipop sticks. 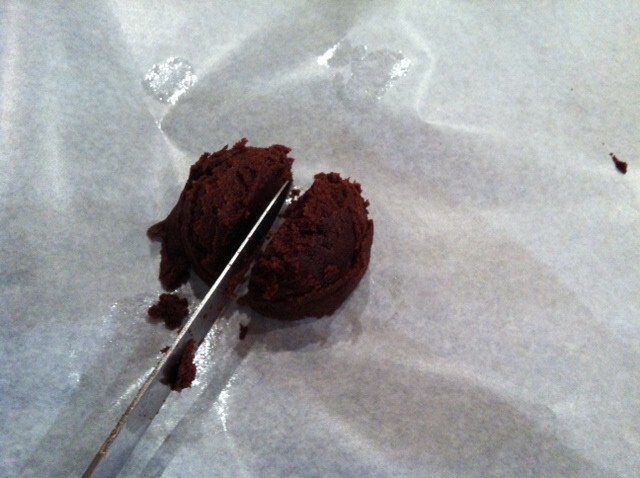 Second, dip the end of the lollipop stick in melted chocolate and immediately insert it into a cake ball. 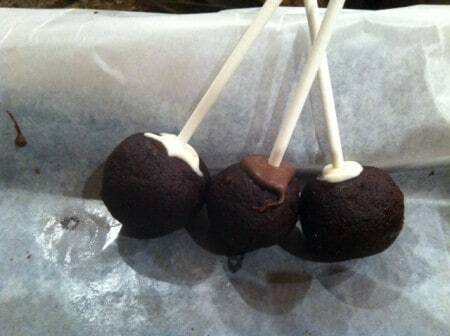 It helps if the chocolate forms a ring around the lollipop stick at the base of the cake pop. This will help secure the stick in the cake pop so that the cake ball won’t fall off when you dip it in the chocolate. Dip the cake pop into the melted chocolate so that it is fully covered, then pull it out and let the excess chocolate drip back into the melting pot. You can even gently tap the lollipop stick on the side of the pot. This will ensure that the weight of the sprinkles won’t cause your chocolate to drip down the stick taking the sprinkles with it! 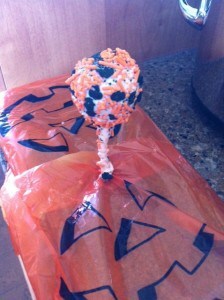 I’m so excited for my guests to see and sample my Halloween Cake Pops this weekend. That is if my husband and I don’t eat them all first! How NOT to Make Cake Pops! 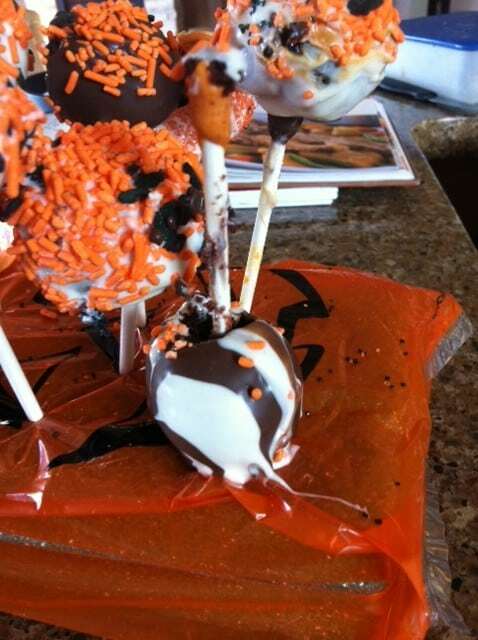 Okay, so in my last post on Halloween Cake Pops I was so excited at how my cake pops were turning out. I proudly displayed all the wonderful photos of preparing the cake and icing and mixing it to form the cake balls (see Part 1 Halloween Cake Pops here). I couldn’t wait to keep working on them but little did I know what was in store for me. So how could I go wrong, right? Well, as it turned out, there are plenty of ways to go wrong when making cake pops and I am here to help you avoid the mistakes I made in my cake pop baking adventure. 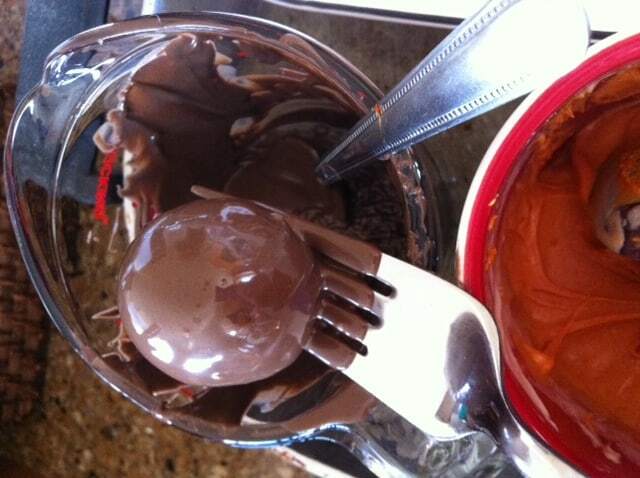 If you don’t carefully drip off the chocolate before you roll the cake ball in sprinkles, the whole mess will start dripping down the lolipop stick. Ack! 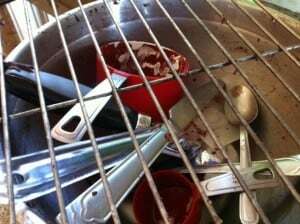 If you have ever made chocolates you may have used this trick of letting the chocolate drip through a fork. 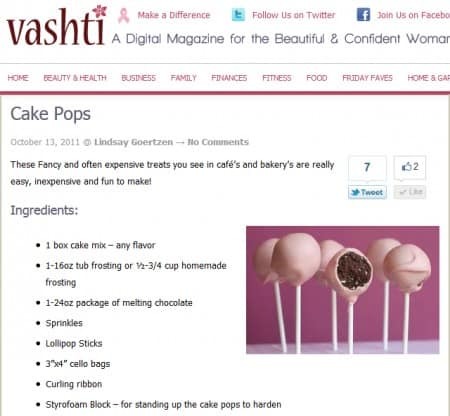 I thought I was a genius for coming up with this nifty way to avoid the dripping disaster (see cake pop mistake #1 above). My plan was to let all the excess chocolate drip off, then I would transfer the cake ball to a bowl of sprinkles, and then insert the lollipop stick. 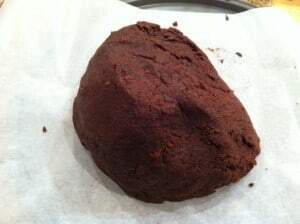 Unfortunately, cake is sticky and soft and it likes to attach itself to the fork and so in trying to detach the cake ball some of the cake would stay on the fork and cause a big mess. Ack! This is what happened to one of my cake pops. 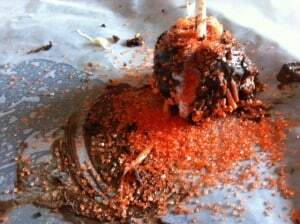 The hardened chocolate on the lollipop stick created a massive hole in my cake pop and as it was setting the whole cake pop dropped down the stick onto my styrofoam base. Ack! This cake pop didn’t even make it to the styrofoam base. When I inserted the lollipop stick it exploded and even though I tried to repair it with extra melted chocolate and attempted to cover my tracks with extra sprinkles, it looks like my cake pop’s guts are spilling out. Appropriate for Halloween I suppose, but not exactly the party favour I was going for. Ack! 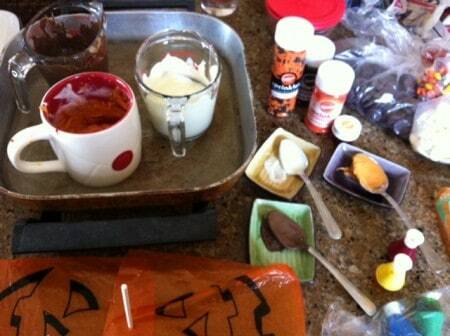 In my extra cleverness I added orange food colouring to melted white chocolate to match my Halloween theme. 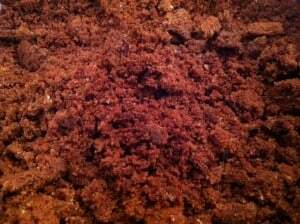 It took quite a lot of food colouring to get the colour I wanted. Big mistake! 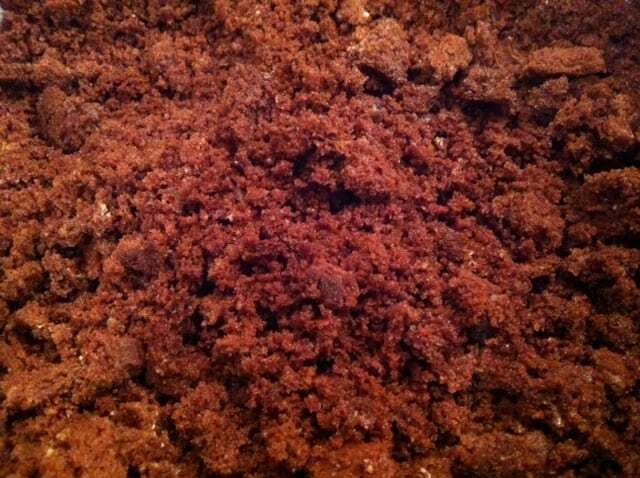 If you’ve ever made chocolates before you might know that you’re not supposed to add water to melted chocolate… well apparently mass amounts of food colouring will have the same effect: the chocolate will harden, clump, and take on the texture of old crumbly fudge. Absolutely no amount of heating, stirring or added butter will make this chocolate dip-able. Ack! 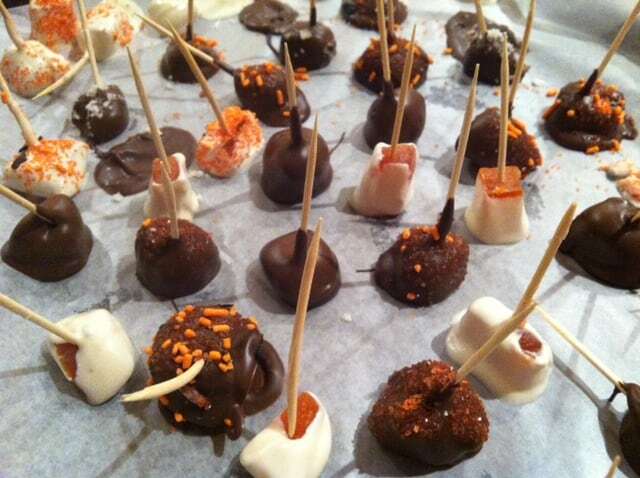 An easy way to get over your cake pop failure is to make these yummy treats which look great and are sure to please your party guests without any flops, explosions or clumps. 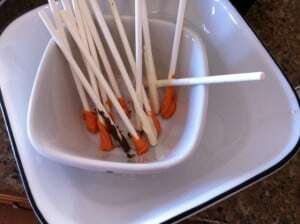 I stuck toothpicks in pieces of Australian Gold Ginger and dried papaya. I dipped the candied ginger in the left over dark chocolate, and I dipped the papaya in the melted white chocolate. I left some of the papaya showing as it is orange and very Halloween-y. 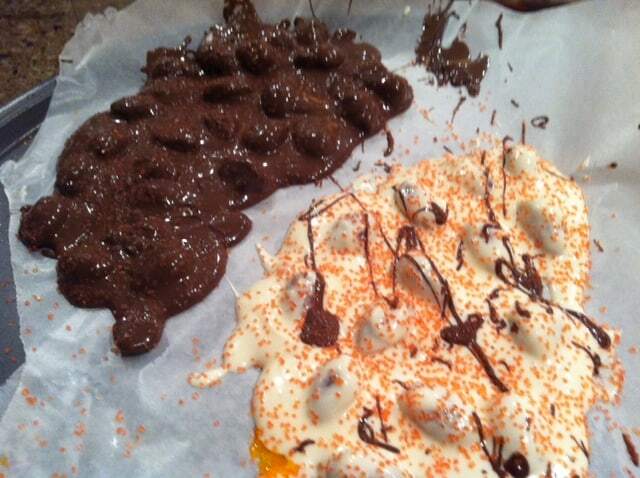 I also used up some of the sprinkles to entice visually and it also gives a yummy crunch to the candy treats. Yum! However pleased I was with myself over these cake pop alternatives, I was still determined to make yummy and cute cake pops. Come back tomorrow to see how I conquered these obstacles, learned from my mistakes and made my cake pop adventure a success! A few weeks ago I saw an article in Vashti Magazine about how to make Cake Pops and I immediately felt the urge to make them myself. They look so YUM! 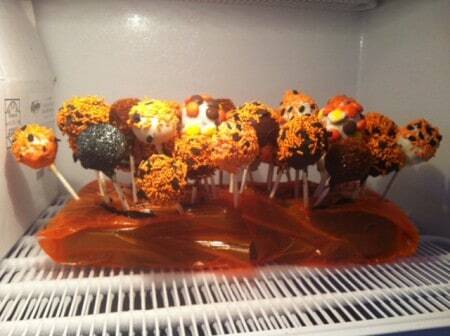 and they are sure to be a party pleaser on Halloween. 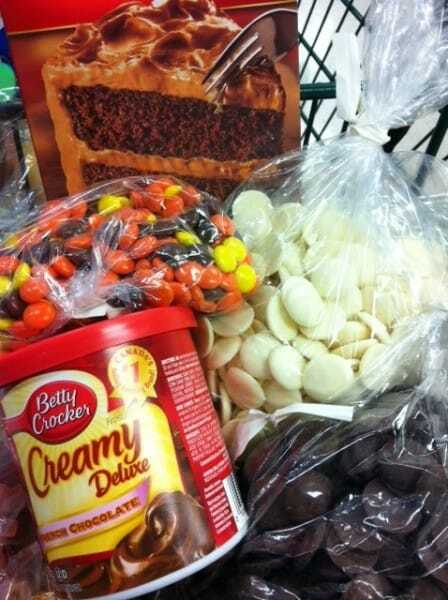 First thing’s first, I went grocery shopping to pick out a cake mix and some melting chocolate. 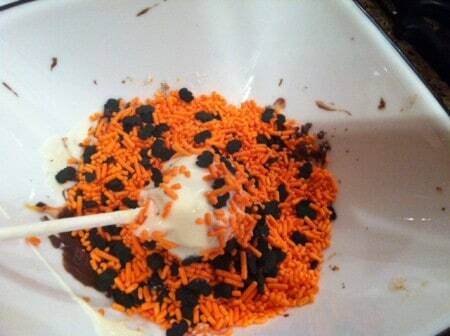 I couldn’t believe that Save On Foods didn’t have any orange or black sprinkles. Shocking! 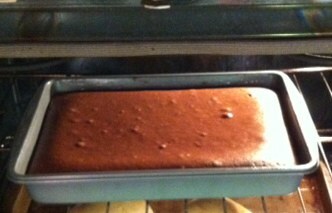 The next step is to mix the icing into the cake mix. However, one of my twitter friends the Klumsy Artist, told me to watch out because cake pops made with store bought icing are almost too sweet to eat. 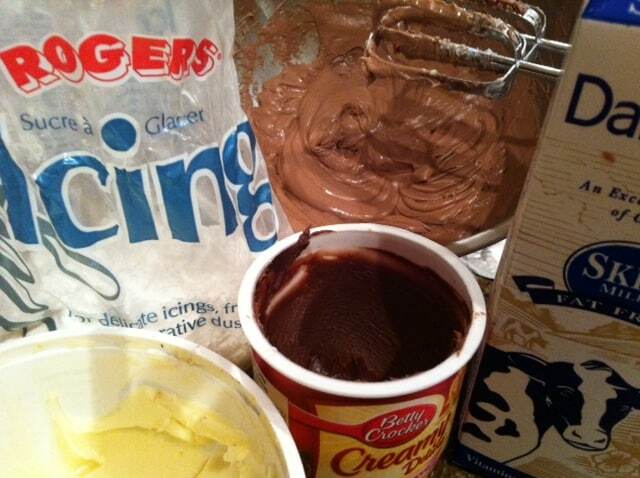 To cut the sweetness of the Betty Crocker prepared icing I mixed it 2 to 1 with margarine, added a teaspoon of vanilla, and a couple tablespoons of milk. 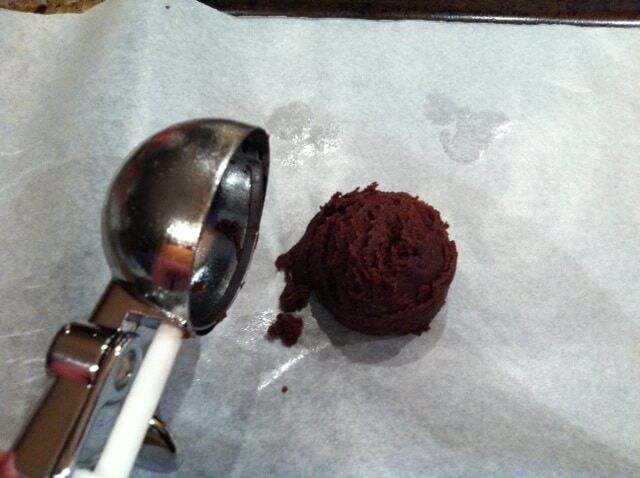 I wanted to make sure my cake pops are all the same size so my husband had the idea of using a levelled off ice-cream scoop to measure out the filling. What a great idea! He modestly gave credit to the fact that he used to work at Tim Hortons. Genius I say. 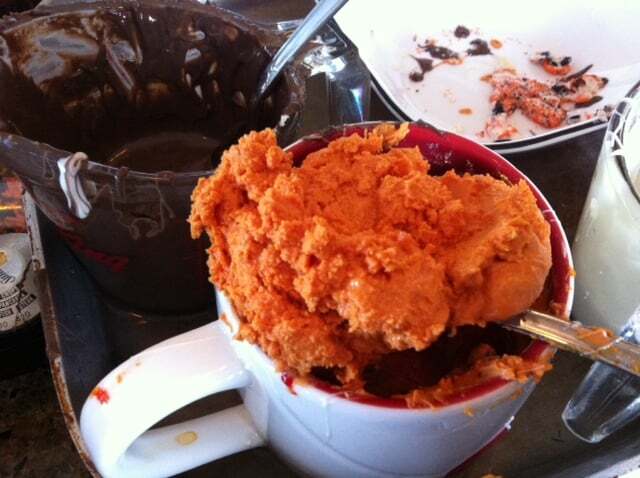 I counted up the scoops and realized I was only going to get 30 cake pops out of all this work. 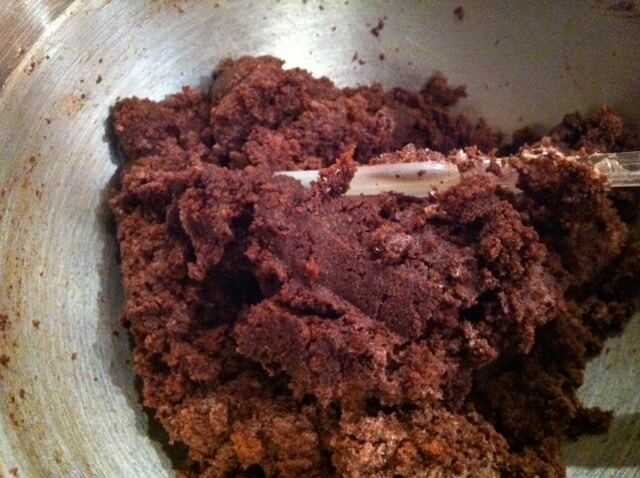 This recipe should make 40-50 so I promptly re-cut each ice-cream scoop of cake-pop-mixture into thirds rather than halves. This worked out to 44 cake pops instead of 30, woo hoo!